Silk, Velvet, and Lace: Costume Festivals! Okay, so I recently became aware that Milton is host to both the Pirate Festival and a Renaissance Festival every summer. I knew about the Pirate Festival and got to attend a little bit of it last year, which was really cool, but I didn't realize there was also second costume-recommended festival as well. Also, Casa Loma has one, and that would just be absolutely fantastic -- to wander around the castle grounds and gardens while it's been made into a faire. So that's really all the excuse I need to justify another couple of costumes. And the nice thing is, they can all use the same basic costume, with different elements being changed up as I wish. 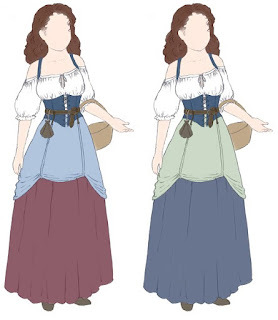 Given that they're all outdoors in the summer, I'd want to make up cotton or linen pieces, so I think I'd go with the basic wench setup -- a blouse and a skirt with some sort of an overskirt or apron, and then a bodice or a corset overtop. I did used to have a nice little wench costume, but none of the components of it were made of natural materials as I was only going to be wearing it at Halloween, and it's also about 4 sizes to small for me now. The first one is very much like the wench costume I made years ago. I'm still quite drawn to it, and as I can no longer wear my old costume, I don't see a reason to rule it out. I like all the options for different reasons, though, and I'm definitely staying away from orange and yellow, as you can tell. I'm avoiding purple, too, although I really like purple. It just doesn't seem right for the costume. Any input about the colour combinations would be appreciated as I'm notoriously bad at making up my own mind. I need to get a ring-belt, and I figure that at the same time I'll get the skirt hikes and a tankard-strap (which I didn't draw as it would just make the picture busier). Generally shops that sell one also sell the other as they're so similar. They do run the gamut, cost-wise, so I'll have to make sure I do some looking around. Pearson's Renaissance Shoppe looks promising from my first few searches, although I'll have to look into what their shipping to Canada is like. I've added it to my list of resources off to the right anyway. I'm always looking for new accessory dealers. 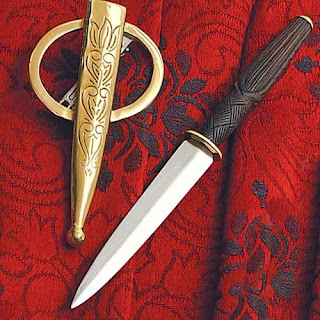 It's a barrette that has an ornament on it that happens to be a dagger. How perfect would that be for a pirate festival? 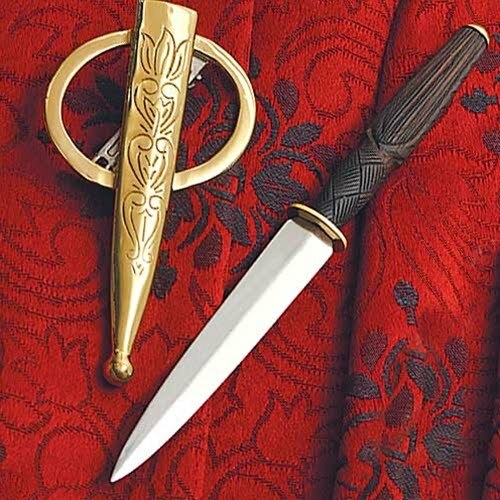 Of course, it's also $70, so I think I'll stick with hanging my dirk off my belt (also not pictured). 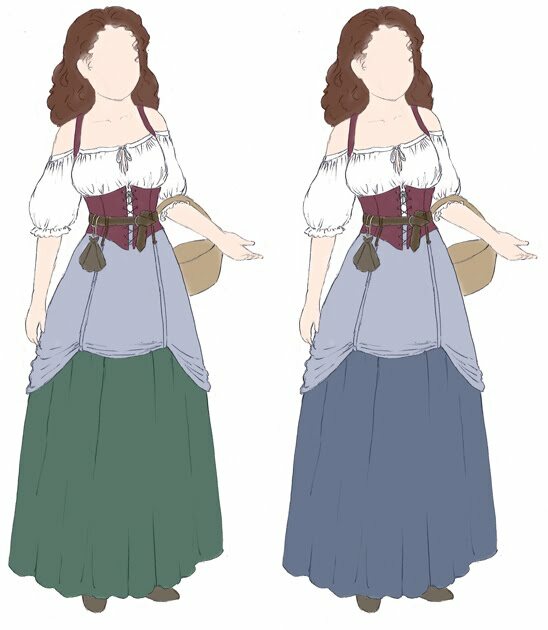 For the ren faire I would keep the blouse and the underskirt (or maybe not -- skirts are the easiest part to sew) and I would do a full overbust corset. I haven't decided if it would have straps or not. I'd also swap out the hiked overskirt for either a simple apron or a handkerchief-style overskirt. And I'd obviously leave off things like the dirk (but I'd keep the tankard). Now, of course, the key part is actually starting and finishing before the fest. That is soooooo cool! I love it!